The Google Nexus 7 is probably the greatest thing to happen to tablets after the iPad - it brought high-end specs to affordable slates and emphasized quality despite the low price, but so far demand for it was so high it sold out in many stores. In the UK, it’s just about to launch on the country’s largest retailer Carphone Warehouse. The European debut of the Nexus 7 will happen on July 27th in the UK, and the price is set at £199, or $310. The price should be for the most basic, 8 gig version of the tablet, but the retailer doesn’t specify in the annonucement. Still, that’s a hefty 50% more than the US price, but don’t be too surprised - electronics on the Old continent tend to be more expensive due to a number of factors. Interestingly, Carphone Warehouse will sell the Nexus 7 off contract and on a tethered contract. The Nexus 7 doesn’t have cellular connectivity but you can use your smartphone data with Wi-Fi tethering. Such an option will let you have the device free at launch but you’d need to pay £20.50, or nearly $32, a month for tethering. London, 25th July 2012, Carphone Warehouse today announced that the eagerly awaited Nexus 7 will be available to buy from Friday 27th July. 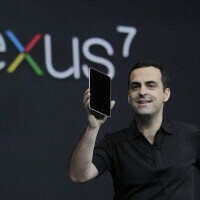 The Nexus 7 is the first tablet in Google’s Nexus line of devices and the lead device for Android 4.1, Jelly Bean. The Tablet, made by Asus, will be available from Carphone Warehouse priced at £199 standalone or for free on a tethered contact from £20.50 per month. Boasting a 7in HD display, and an Nvidia Tegra 3 quad-core processor, gyroscope and accelerometer, the Nexus 7 is ideally suited to gaming. With over a million pixels in your hand, text is sharper, high-definition movies are more vivid, and the responsive touchscreen makes switching between apps, flicking through ebooks or surfing the web buttery-smooth. The Nexus 7 has all the portability of a paperback book, but is connected to the entire digital world of entertainment. Nexus 7 was made for Google Play, putting all the entertainment you love right at your fingertips -- choose from more than 600,000 apps and games, thousands of ebooks and movies, and everything the web has to offer. The Google Nexus 7 will be available from Carphone Warehouse stores, online at www.carphonewarehouse.com or by calling 0800 925 925 priced at £199.99 standalone or for free on a tethered contact.